Devices with smaller transistors are affected more by cosmic radiation. Here's a new one. Space particles from the sun and even distant black holes are affecting microelectronic devices more than ever, according to a recent study from Vanderbilt University. Chip manufacturers are packing in more transistors, increasing the chances a high-energy particle will strike one. While rare, such "bit-flips" may have caused a Qantas aircraft plunge and voting machine failure. With electronics devices all over the place, it's forcing designers to take the phenomenon into account. Outside the protective cocoon of the Earth's atmosphere and magnetic field, cosmic radiation from solar and galactic cosmic radiation can cause illness and death, as astronauts know. When they strike the atmosphere, they can generate secondary particles like neutrons, muons and alpha particles. Millions of those bombard us per second without any effect, but a few are strong enough to push electrons around in chips, causing "single-event upsets" (SEUs) and data failures. Scientists are well aware of the issue and have been studying it for years. Vanderbilt researchers have looked at the last three generations of chips with 28-nanometer, 20-nanometer and, most recently, 16-nanometer transistors. To test them, they expose chips to radiation in a special lab called the Chips and Electronics (ICE) House at Los Alamos National Laboratory. With smaller traces, the latest chips require less electrical charge to make a bit, so the odds of one flipping from 0 to 1 (or vice-versa) when struck by a particle have shot up. That's offset by the fact that smaller transistors are less likely to be hit, but there are a lot more packed into the same space. 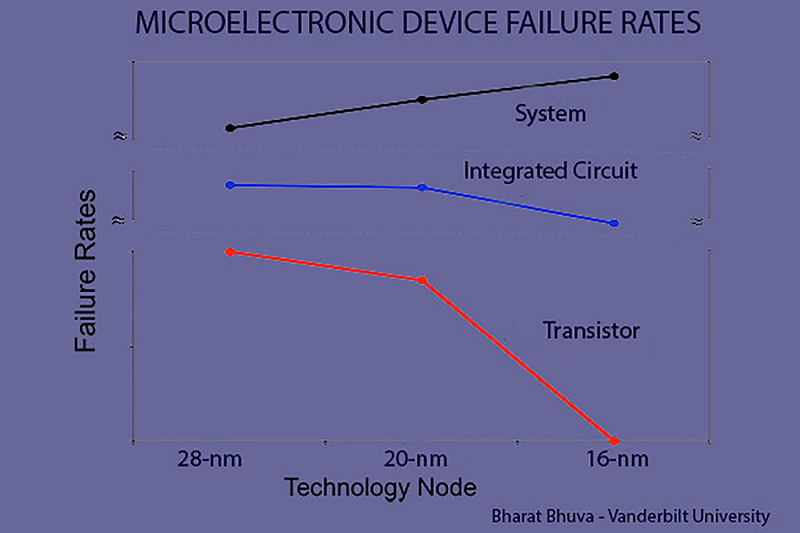 As a result, failure rates of devices as a whole has gone up with the latest chips, as shown above. On top of that, there are more devices than ever, so the odds of one failing with an SEU are higher. Phones are one thing, but in another case, a single bit flip on an election voting machine gave 4,096 votes to one candidate, more than the number of registered voters. A similar event may have also glitched a Qantas A330's autopilot, causing a dive that seriously injured 11 passengers and a flight attendant. "Our study confirms that this is a serious and growing problem," says Vanderbilt researcher Bharat Bhuva. Luckily, firms in aviation, medical, IT, transportation and other critical sectors are addressing the problem by using backup systems, error correction and other measures. The consumer electronics sector is lagging behind, but companies like AMD, ARM and Qualcomm, which sponsored the latest study, are at least aware of it. And if your phone does get zapped by a stray particle, the worst that can happen is a glitch or "blue screen of death" -- annoying, but not dangerous.